Since they don't have much size, the Brethren Bobcats are working on developing their foot speed, technique and athleticism heading into the 2018 season. Brethren football players go through an agility drill as they prepare for the 2018 8-man football season. The Bobcats have some key veterans coming back, including a pair of four-year guys on the offensive line. Brethren's least experienced area is the defensive backfield where the Bobcats and that's where first-year coach J.J. Randall has been working the hardest to develop. 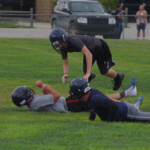 Brethren's football team is getting ready for its third season in 8-man football and hopes to jump into the playoff picture. First-year head coach J.J. Randall just wants the team to show growth week by week, and will let the rest take care of itself. As if running the varsity boys basketball program at Brethren the past two years wasn’t enough for him, J.J. Randall begins his first season at the varsity football team’s helm this year. Randall, who attended Bear Lake and was a guard on the basketball team and running back for the Onekama co-op football team, says he’s not overwhelmed by the time commitment doing both jobs entails. 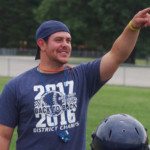 He was the Brethren girls soccer team’s first coach and guided the Bobcats through their first two seasons before stepping down two years ago and coached the junior varsity football team last year. “I love sports, and it’s a chance to be head of another program,” Randall said during a break in practice Tuesday evening. “Just to be a positive influence to the kids and athletics in our school. Working with my assistant coaches has been a good experience. The numbers are pretty good for Randall’s first season running the show, with between 26 and 27 athletes out for the sport. Randall says he plans to have 11 or 12 on the varsity with the rest playing junior varsity football. Randall’s major focus the first few days is to keep practices energized and enthusiastic. The Bobcats even have music blaring away as they run through their drills. The focus was on defense Tuesday, with Randall working with the defensive backs. Brethren has five seniors on the team who all saw extensive playing time last year in the Bobcats’ second season playing 8-man football. A key returner is 6-foot-3 wide receiver Logan Tighe, while Gavin Asiala is going to play a little bit of quarterback and wide receiver with Troy Macurio coming in as the probable starter under center. Hunter Wojciechowski will be the Bobcats’ anchor on defense at nose guard, with Asiala flying around at linebacker. Randall is hoping the Bobcats have other athletes who can fill in the other spots, particularly in the backfield on pass defense. “Macurio hasn’t really played quarterback much before, but he’s a real tough kid and he’s very athletic,” Randall added. “We’re going to have to use his athleticism and his arm strength because we don’t have the luxury of just being able to pound the ball up the middle. 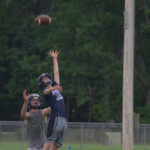 Brethren doesn’t have much size on the line and will need to emphasize its speed to be effective in opening holes for the running backs and quarterbacks. The Bobcats will need to use their foot speed and athleticism, as well as fundamentals and good technique to move defenders aside to get some running room. Wojciechowski and Adrian Dean are both four-year varsity starters. Anthony Becaria, one of the bigger players on the team, played a couple games on varsity at the end of last season, and while he’s only a sophomore is expected to have an impact on the line. Randall is emphasizing seeing growth week by week. The rest will take care of itself.